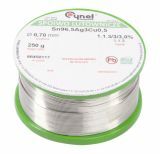 CYNEL Unipress, founded in 1984 in Poland, is specialized in soldering products manufacturing: solder wire, flux, (multicore) tin-lead solder alloys and a wide range of alloys with different diameters. The company conforms to ISO 2009 and is highly responsible to the environmental protection. Lead solder Sn96.5%, Ag3%, Cu0.5%, ф0.7mm, 217~219°C Lead solder (soldering tin) with a diameter of 0,7 mm. Content of tin, silver, copper (Sn96.5Ag3Cu0.5) and melting range 217°C to 219°C. Solder wire Ф0.7 mm, 0.250 kg pack Solder wire with diameter Ф0.7 mm, 0.250 kg pack, flux content 2.5 %, plumbum 40% (Sn60Pb40). Soldering temperature 190 °C. Solder wire, Sn60/Pb40, Ф1mm, 16g Solder wire. List Price 2.90лв. VAT Incl. 2.76лв. VAT Incl. 2.61лв. VAT Incl. Solder wire Ф1mm, 0.250kg pack Solder wire with diameter Ф1 mm, 0.250 kg pack, flux content 2.5 %, plumbum 40% (Sn60Pb40). Soldering temperature 190 °C. List Price 23.90лв. VAT Incl. 22.70лв. VAT Incl. Solder wire SN96A-1.0/0.25, Ф1mm, 0.25kg Solder wire SN96A-1.0/0.25. Application for soldering SMD components. List Price 54.90лв. VAT Incl. 52.15лв. VAT Incl. Soldering F0.5 mm, 0.100 kg Solder (soldering tin) with a diameter of 0.5 mm, flux content 2.5%. Content of tin, lead (Sn60Pb40). Soldering temperature 190 ° C.
Lead solder wire LC60-1.00 / 0.1, Sn60%, Pd40%, 1mm, 190°C Lead solder (tin for soldering) with diameter 1 mm with tin content Sn60%, lead content Pd40% and melting temperature 190°C.